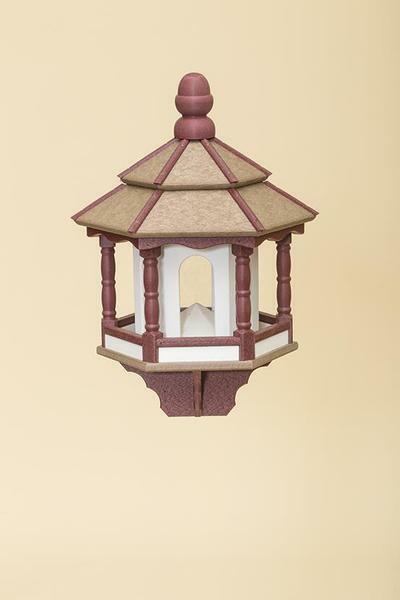 Nothing says summer like the sweet sound of birdsong - and nothing makes the birds sing like an Amish handcrafted bird feeder! This hexagonal bird feeder is durable, versatile, and endlessly entertaining. Try different foods - varieties of seeds, bird feed, or even fruit jellies - to attract different birds to the feeder and help to make this summer the busiest ever in the skies above your garden. Simply lift the top tier of the roof to add feed. Additionally, this feeder's poly construction means it's as good for the birds as it is for the environment. Poly is an incredibly durable, low-impact material made from recycled milk jugs right here in the USA, so the vibrant colors and elegant design on this bird feeder will remain strong through seasons and seasons of use. Choose from a rainbow of color options to find the perfect fit for your garden. If you've got any questions at all, please don't hesitate to get in touch - we'd love to hear from you. Optional Post and Planter Note: The post will be wooden either way, but if you choose the poly base, your post will be covered with a PVC sleeve to help protect it from the elements. If you order the accompanying mounting post, you'll receive the planter box at the bottom, a handy addition that makes a happy home for a wide variety of plants. *Custom post opening sizes are available. Please call to inquire. Proudly made in the USA by Amish craftsmen. Proudly an environmentally friendly product. Great for the garden and backyard. These bird houses are available in a whole rainbow of vibrant shades - choose your perfect match above. I received the bird feeder and it is beautiful! The birds in my yard will be very happy, as am I! Thank you for your help with this, Jennifer. Thank you so much for letting me know tracking #. I think your company has been exceptional to work with and I appreciate everything you've done. I'm very excited to get my birdfeeder!